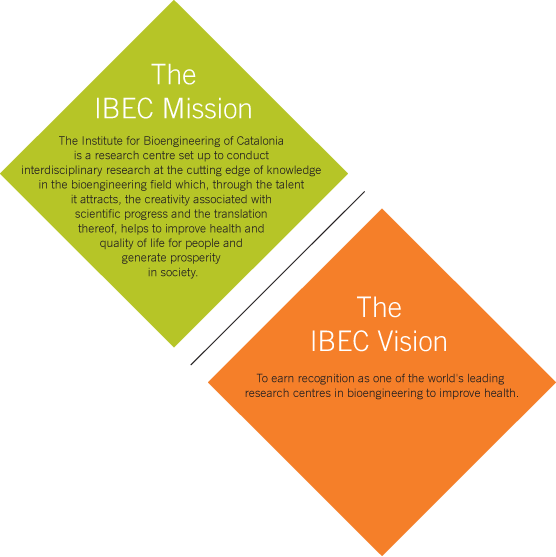 IBEC is a research centre whose purpose is to carry out interdisciplinary research at the highest international quality level which, by creating knowledge, helps to improve health and quality of life and generate wealth. 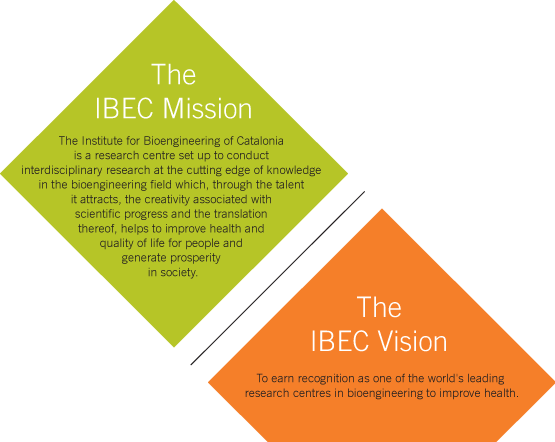 Beneficiaries of the Institute for Bioengineering of Catalonia include the universities, research centres, the scientific community, the business sector that drives research in the bioengineering field, and society in general. Based on IBEC’s mission and vision, our values were identified and defined by the “From values to excellence” project, an action within the framework of the Human Resources Strategy for Researchers according to the European Charter and Code. It was a participatory process in which several interdisciplinary working groups, made up of management, researchers of all levels and support staff, met between October and November 2016 to identify and define, based on their perception and experience, the values that make the institute unique. These values help to guide the choices and decisions that our researchers make in their working life. Collaboration in the sense of mutual and constant support. Collaboration entails feeling secure, backed and well-represented, and is present at all professional levels, regardless of hierarchy. It means being service-oriented both internally and externally, and predisposed to integrating knowledge and resources for the common good. Creativity is behind the initiatives and research proposals that lead IBEC to succeed and gain international recognition. Creativity stems from curiosity, and is the ability to move outside our comfort zones, valuing and integrating what already exists to transform it into something original that otherwise could not exist. Creativity is also seen in the integration of different talents and resources to achieve innovative and high-impact results. Respect is the basis of collaborative work, relying on acceptance and listening to differences, and allowing both a prejudice-free focus and an approach that’s open to various ideas, as well as building strong and enriching relationships. Perseverance is the constant pursuit of realistic high performance, keeping the focus on individual and corporate motivation and continuous learning to make processes, results and resources sustainable over time. It relies on understanding the demands of our positions, knowing how to value both internal and external resources, and turning efforts into a source of positive satisfaction. Responsibility is commitment to the profession, and thus acting according to principles of good faith, integrity, honesty and transparent communication, seeking and maintaining an ethical code of clear behavior, and adhering to best practices in science. It is based on the individual assuming the consequences of decisions he or she makes, being aware of and responsible for them, and reporting them where necessary. It makes scientific freedom possible, and helps us stay reliable and relevant in the research world. Our interdisciplinary working environment relies on multi-talented, versatile individuals. It also reflects the ability to contribute from different perspectives, integrating knowledge at both group and individual level. It is based on the ability to function in more areas than those mastered thanks to training and continuous development, helping to create an adaptable and flexible system which is capable of achieving excellent results even with limited resources. Externally, openness means explaining, making things understood and establishing a trusting relationship with partners, employees and society, acting openly and accurately in the delivery and communication of both scientific and non-scientific results. Internally, openness ensures the consistency and consequence of our own decisions, identifying a frame of reference that enables understanding. 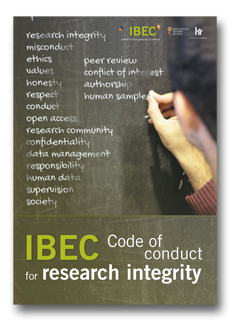 The IBEC Code of Conduct for Research Integrity (the Code) is one of the actions within the framework of the Human Resources Strategy for Researchers (HRS4R) according to the European Charter & Code. The Code is a framework for good research practice, setting the criteria for proper research behavior and establishing an environment conducive to high-quality research, thus ensuring that research is conducted according to international ethical standards. The Code complements IBEC policies and procedures such as those for health and safety, working conditions, intellectual property, and does not replace them. Its content is complementary to the laws in force. Together with the promotion of the Code, IBEC wants to take a proactive role providing training to researchers in this respect throughout their careers and raising awareness on the subject, thus preventing future problems. The Code sets out the ethical standards and standards of research conduct and sets out principles, recommendations and commitments. By making clear the conduct that is expected and considered effective, the Code contributes to an atmosphere of openness. The most up-to-date version of the Code can be accessed here. The Code applies to and should be known by all professionals linked to IBEC at all career stages, so please read it carefully. To promote and safeguard good research practice at IBEC. To promote awareness and training for researchers at all career stages. To monitor compliance with the Code and update it regularly. To deal with allegations of research misconduct. Allegations of research misconduct may be communicated by any IBEC member through any means to any member of the Commission for Research Integrity or the Head of the Human Resources Unit. The specific procedure is detailed in the Code. Please do not hesitate to contact any member of the Commission for any matter regarding research integrity at IBEC.